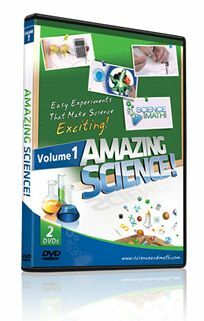 ScienceandMath.com, an award winning program, sent us a DVD called Amazing Science, volume I to review. This DVD pack comes with two DVD's in it and is filled with a good variety of experiments suitable for grades 1-3. Here is a list of some the experiments that we looked at (there are 23 altogether). Each Lesson starts off with Jason talking about what the experiment is going to be about. He'll do some introductory talking and then a label will appear on the screen that gives the name of the experiment. Then he will do the experiment. After the first video I learned quickly to simply STOP the video. To do it and let my lad discover what will happen on his own. Once he conducted the experiment we would watch it being down and then I would stop the video and ask the lad why he thought the experiment did what it did. reversing things with water. The lad had fun with this one. He ended up drawing a bird and a pig and letting them chase each other through the water. I overall liked it how they set it up It was clear about what was going to be done, what was needed to conduct the experiment, and then showed the experiment in action, followed up with WHY it worked, what the science was behind it all. I liked that continuity. I liked the variety in the experiments. I loved the clarity of teaching. It's great to get the solid reasoning behind why the experiment did what it did. I loved that aspect of it. What I struggled with: lack of clear explanation of what the scientific process was. The Not helping students develop that process in themselves. Asking what do we think might happen? What I would have liked to see (since it's how I approach doing science) is.. answers to questions such as....How can we fix it if the experiment if it didn't work the way we wanted it to? How can we modify the experiment to ask a different question? (or at least giving the students the tools to be able to do that themselves). He started off interested in the DVD. He wanted to know what he could do, and how soon he could it. But unfortunately that interest level did not last. "Mom, do I have to do that science? Can I do the other science instead?". When I asked him why he didn't want to do it. "Mom, they do it all for me. If you don't stop the video in time I know what is going to happen, and then I don't need to do it, cause I KNOW it's going to work". When I talked with Hubby about it, he said the same thing. They are a well done video, but they don't leave room for exploration. If you are new to doing science and you want to interest your children in what you can do when learning science, this is a great tool. If you are doing a class and can't do every experiment that you want to since you may not have the needed supplies.... excellent tool. (the magnet and copper pipe experiment fascinated the lad). this surface tension experiment intrigued the lad, it was the first one we did and he had a lot of fun chasing the pepper around. You can find ScienceandMath.com on Facebook as well. Some other products were reviewed as well by the Crew. They are as follows. Please do go visit the TOS Crew Review Board to learn more about these products, as well as to hear what others thought of the Amazing Science DVD. :) You can find those reviews for science experiments and math help here. (or click on the link below). We received a review item in the mail yesterday. Amazing Science, we watched two episodes today and did one experiment.